An Android dialer is in the making by Facebook developers that will deal with the controlling of the huge database consisting of phone numbers of the largest social networking website of the world. Facebook also reportedly provided the confirmation details about the app known to be as the Phone but no more details have yet been given by the company. According to Facebook they usually test various apps and similar things so nothing really can be announced in the current scenario. This particular app under development “shows you info about who’s calling and automatically blocks calls from commonly blocked numbers.” The install button currently gets an error in return so there’s nothing much to go off. As Facebook has a current number of 1.39 billion users so caller ID makes lots of sense. Since a majority of the users have their phone numbers saved in context with their profiles so a Facebook Android dialer would allow you to know who is calling even when you don’t have their number saved in your phone before. Its obvious that all of us don’t like unwanted calls Which makes the other feature more interesting to follow on. 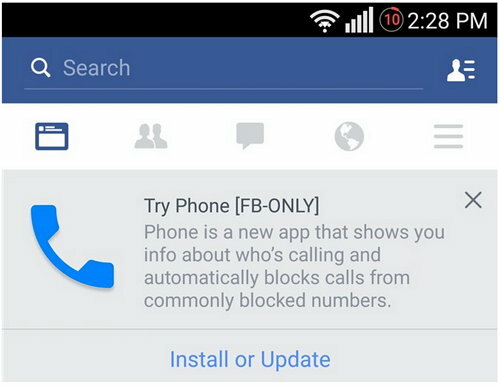 Although this is apparent that other competitors can easily replicate and can be a great threat to Facebook’s new dialer. Since Facebook offers around eight apps for mobile platforms supported by Google specifically for Android. It seems rather confusing whether this dialer will be up in the market with great boom or not after the decline of the most hyped Android home screen Facebook app. It is really interesting to see how Facebook is actually working on something like this. This initiative in itself will make the users go curious about the upcoming app. Rumors about Facebook introducing a new phone are also up and apparently dying down with this Android dialer coming up next.